I just read that when Cassini makes it's first close pass of Saturn's F-ring on December 4, it will be the 183rd time the engine fires. I googled Cassini's engine and found this site which has a cool 3D WebGL(?) model of Cassini's engine(s) that you can rotate with your cursor. The main engine is used for spacecraft velocity and trajectory correction changes. To be on the safe side, there are two identical main engines: One is in use and the other is a backup. There are also 16 monopropellant hydrazine thrusters of which eight are prime and eight are backups. The thrusters are used for attitude control and also for small velocity-change maneuvers. 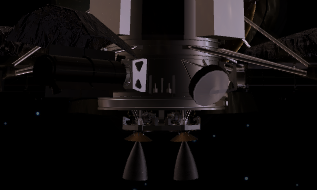 The two engine nozzles in the 3D model appear to be slightly angled so that they are both axial with the spacecraft center of mass, but the view is not orthographic and the shapes of the nozzles themselves are highly distorted. In reality, are the two nozzles really oriented so that their axes both intercept the spacecraft center of mass? THough there are thrusters, it seems like you'd want to at least try to minimize the torque of the laterally offset engine(s). aboveL Screenshot of this 3D interactive model of Cassini's engines. Not only are they canted, they are gimbaled in two axes. The gimbals are used to fine tune the pointing through the CG that moves as propellants are expended. I haven't found a pure orthographic drawing of Cassini, but the illustration on this page seems pretty clear that the thrusters are canted outward, and there's good reason to believe they would be. 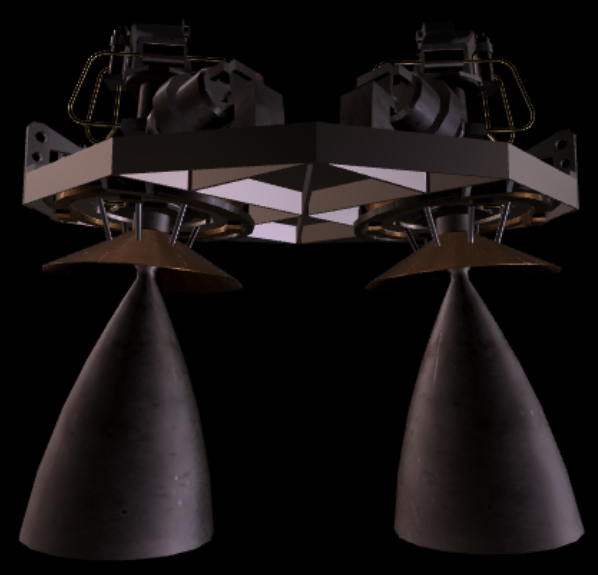 There's also a full view interactive 3D model of the spacecraft on the JPL site, using a "longer lens" (thus less perspective distortion) than the engine model you linked; after playing with different viewing angles there I'm satisfied that the thrusters are canted. Not the answer you're looking for? Browse other questions tagged spacecraft cassini or ask your own question.